Traditional IRA and Roth IRA contribution limits increase with the inflation rate in $500 increments. The contribution limit does not increase in some years because inflation wasn't high enough to trigger the next increment. Neither Traditional IRA nor Roth IRA contribution limits can be rolled forward to a future year. If you don't reach the limit one year, there is no option to increase the next year's limit. The latest deadline for meeting the contribution limit is the initial tax filing deadline, usually April 15, unless it falls on a weekend. For example, if you wanted to fund your retirement account up to the maximum permissible contribution for the tax year 2018, you would have until April 15, 2019, to get the money into the account. This chart details current and historical Traditional IRA and historical Roth IRA combined contribution limits going back more than a decade-and-a-half. The two columns represent the combined contribution limits for those 49 years old or younger and those 50 years or older. Investors who reach 50 years old are entitled to put aside more money each year in pursuit of financial independence or retirement security. As you research these limits, you most likely will notice that Traditional IRA contribution limits and Roth IRA contribution limits are written into the U.S. tax code in a way that they are always identical. An investor can contribute to either a Traditional IRA or Roth IRA, or split the contribution between the two, but the combined annual contribution limit still applies. For example, in 2017, if you were 28 years old, you could contribute a total of $5,500 to either your Traditional IRA or your Roth IRA without exceeding the contribution limits and being hit with significant penalties. Stated differently, if you put $2,000 into a Traditional IRA, you couldn't put more than $3,500 into a Roth IRA that same year. On the other hand, you can fund the maximum amount in either a Roth IRA and Traditional IRA and still take advantage of another employer-sponsored retirement plan, such as a 401(k), 403(b), SIMPLE IRA, or even SEP-IRA. When funding your Traditional IRA or Roth IRA, contributions do not have to be made in one lump sum at the same time. For example, if you were 55 years old in 2016, and wanted to have $125 taken out of your checking account automatically each week for the entire year to fund your Roth IRA account, you could do that. By the end of the year, you'd have deposited exactly $6,500, which is the most you are allowed to contribute. There are certain income limitations on whether or not you can fund a Traditional IRA and take the tax deduction or fund a Roth IRA. 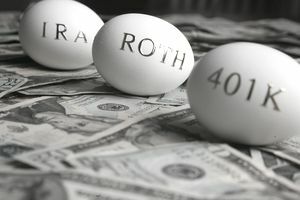 If you are eligible for both, a Roth IRA is almost always the better choice as a Roth IRA is the closest thing to a perfect tax shelter that exists in the United States for the typical investor. There are a plethora of rules around Traditional IRAs and Roth IRAs, particularly involving withdrawing your money before you reach 59.5 years old. If you find yourself in need of your funds, there are eight ways you potentially can avoid the 10 percent early withdrawal penalty that applies to any other taxes that might be owed.